A drawing of Caput and Cauda across the Ascendent-Descendent line from a fourteenth-century manuscript. Reproduced by permission of Fortean Picture Library. Caput Draconis (Latin for “Dragon’s Head”) is an older term for the north lunar node. 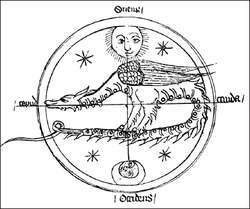 The stone is the dragon's head, caput draconis and the site of the evolution of consciousness through assimilation of mercury and sulphur (spirit and body).